NEW YORK, NY — Ben True, Diamond League winner. 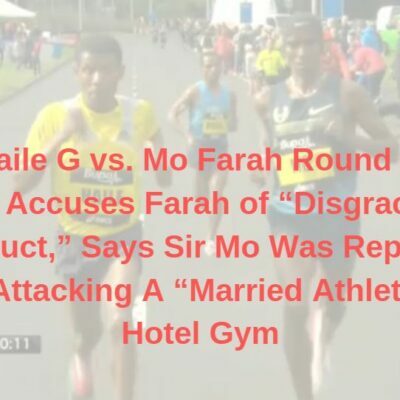 That is something no other male American 5000m runner can say. 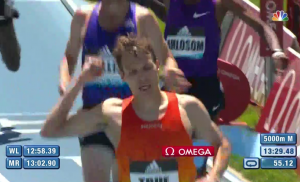 True, running in warm sunny 80 degree conditions in New York City, battled back the final 100m to kick past Kiwi Nick Willis to finish off a 55-second last lap and win the adidas Grand Prix 5000m in 13:29.48, the slowest winning time ever in a Diamond League 5000. 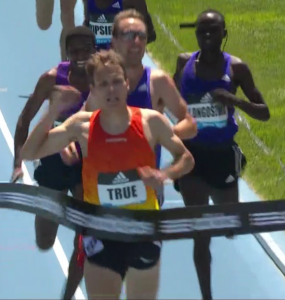 True has been killing it ever since he failed to make the U.S. XC team in February. 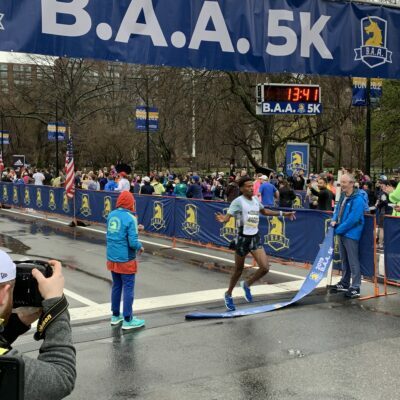 In the last two months, True has set a U.S. road record at 5k (13:22) in Boston, taken down Stephen Sambu to win the Healthy Kidney 10k and won his first Diamond League race. 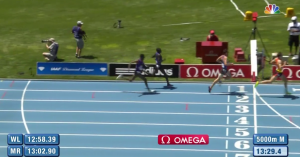 True was only in third coming off the final turn but closed extremely well over the final 50 meters to edge out Nick Willis for the win in 13:29.78. 28-year old Eritrean Nguse Amlosom (Tesfaldet), who has a 59:39 half marathon pb and was 4th at World Half last year, was third in 13:30.22. 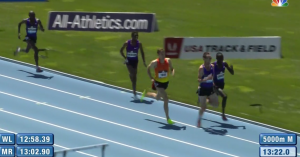 The field chose not to follow the rabbit that closely and came through 1600 in 4:18. After the rabbit dropped out, Longosiwa went to the lead just before 3k (8:12.09) as the field was still tightly-bunched. Surprisingly, right after two miles, Ethiopia’s Olympic silver medalist Dejen Gebremeskel dropped out. With Gebremeskel out and Worlds silver medalist Hagos Gebrhiwet a scratch, True’s chances of victory were growing. He still had a lot of work to do however, as Longosiwa — who ran 12:59 in Rome last week and won in Birmingham last Sunday — posed a serious threat. The pace gradually picked up over the final mile. 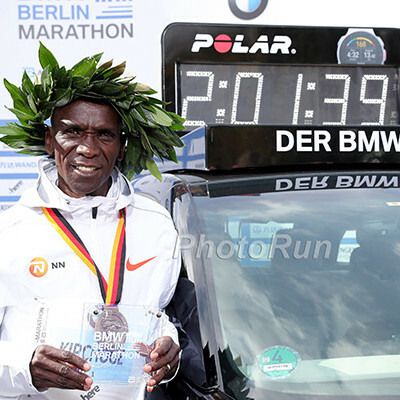 Uganda’s Moses Kipsiro covered the fourth-to-last lap in 65.89 seconds. After a 65.44 third-to-last lap, eight men remained in the lead pack. Kenya’s Nixon Chepseba moved into the front after a 64.16 penultimate lap but things didn’t really get going until Longosiwa went to the lead with 250 to go. True went right with him and they were running 1-2 in the final turn. 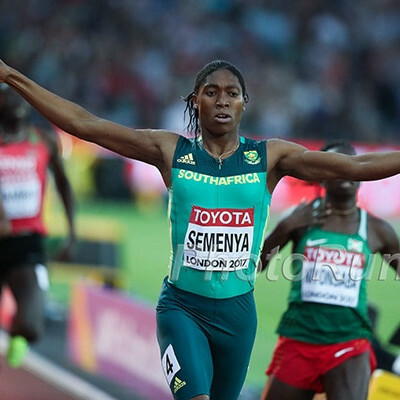 They were quickly joined by New Zealand’s Nick Willis, who launched into a furious kick with 200 to go, and as they hit the homestretch, Willis and Longosiwa were level as True ran in third. 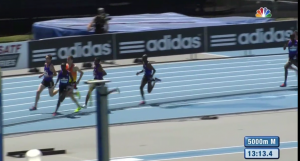 It looked like the 3:29 1500 man Willis was going to kick to the win, but True wasn’t done yet. He attacked again and began to gain on Willis, passing him with around 30 meters to go and holding on for a famous win. The last lap was 55.14 leader-to-leader (so probably slightly under 55 for True) but it was True’s ability to dig deep at the end that won him the race as he was clearly the strongest over the final 50 meters. Discuss this race in our fan forum: BEN MF TRUE!!!!!! Quick Takes, Post-Race Interviews and Results appear below. 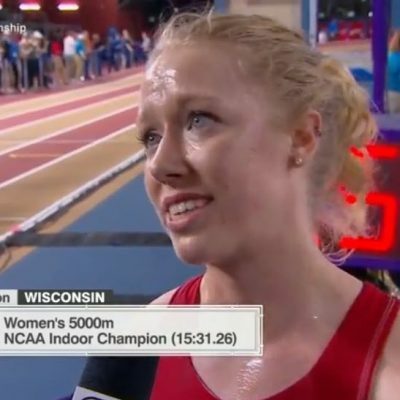 Say what you want about the time or the field, but Ben True has done something that Galen Rupp, Bernard Lagat, or any other American man has never done – win a Diamond League 5000. True got some good fortune with Hagos Gebrhiwet being a late scratch and Dejen Gebremeskel, who ran 13:00 in Rome earlier this year, dropping out, but True got the win. Nick Willis came by him the final 100m and True did not quit, but battled back for the win. This field overall was fairly weak, but the guys True did race — and beat — had some pretty good speed. Longosiwa has run 7:30.09 for 3k and has an Olympic bronze medal — you don’t get one of those if you can’t kick. 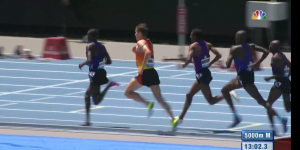 Willis, the 2008 Olympic silver medalist at 1500, has even better speed as he ran 3:29 for 1500 just last year. The fact that True was able to outkick both of them is impressive. 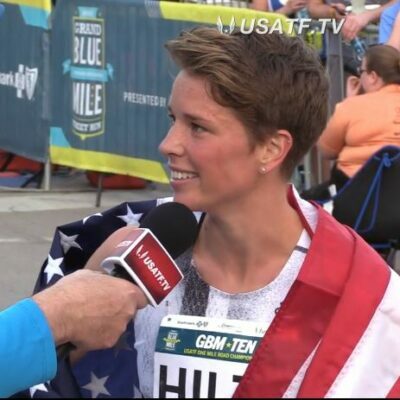 True will run the 5000 or the 10,000 at Nationals and will have to take on a favored Galen Rupp in both events, but True’s progress in 2015 opens up the possibility of True beating Rupp, particularly in the 5000. 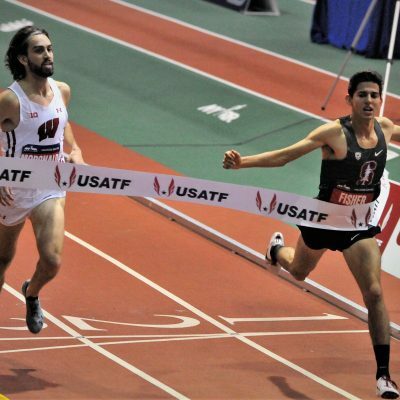 With Bernard Lagat now 40 years old, USA nationals were looking like a coronation run for Rupp, but True could be a worthy challenger for Rupp in the 5000. In the 10,000, True still hasn’t mastered it yet and was outkicked by Andy Vernon this year. Quick Take #4: With Gebrhiwet not starting and Gebremeskel dropping out, Kenya’s Thomas Longosiwa (12:59.78) was the only guy finishing this race that’s gone under 13:20 this year. 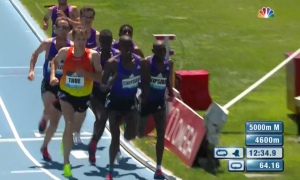 A slow tactical 5000 sets up very well for a 1500 runner like Willis, but he wasn’t able to capitalize on it today. He said, “I’ve watched a lot of 5Ks on TV and the few slow ones that take place, which there aren’t many, you always wish you were part of those. And then I was finally there, but with the bell I wasn’t ready to gun it like I would in a 1500.” At that point he thought he might only get 3rd or 4th, but surprised himself by taking the lead. In the end though, he wasn’t able to hold off True. Willis also talks about the heat, realizing altitude training is important, his tendency of peaking too early and the road mile he ran against high school 4x400s on Monday. Screenshots from the NBC telecast.